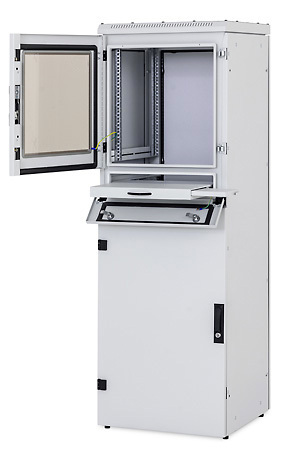 Cabinet for industrial applications – removable sections, suitable for computer installations, RPA - IP20, RPE - IP54, capacity 400 kg. RPE with IP54 protection suitable especially for dusty environment. RPA with IP20 protection has a perforation in the base and top part including cable entries and preparations for fan units. 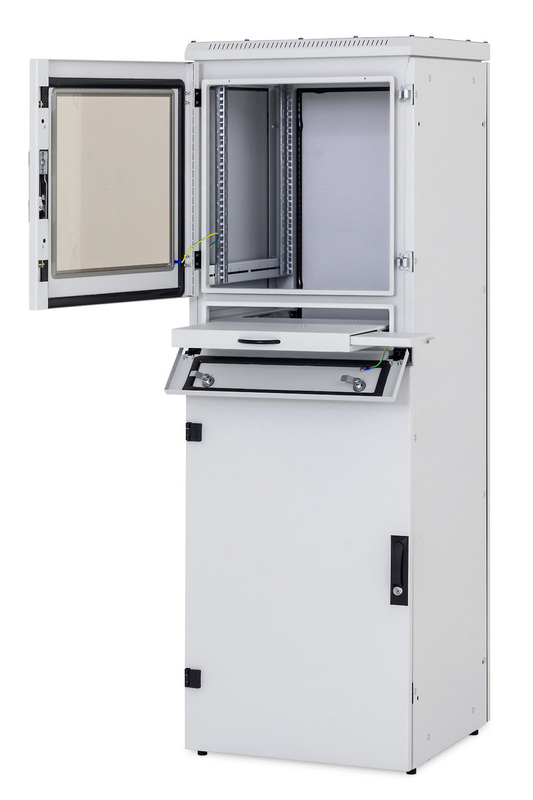 The RPE cabinet has no perforations, all the doors and covers are equipped with a sealing that ensures protection against dust penetration and humidity. RPA/RPE cabinet has three independently lockable sections. The upper and bottom section are locked by a Triton handle-lock; the slide-out middle section, intended for a keyboard and a mouse, has a single point lock. All sections in the standard version are operated by the same key. Vertical 19” rails can be adjusted freely in any depth of the cabinet. This simplifies mounting of devices and configuration of connecting cables. Prepared for mounting castors and levelling feet. – Single doors in variants fully-metal or glazed with safety tempered glass 4mm are mounted on the front of cabinet. Model RPE has doors sealed by foam gasked and fixed by multipoint locking system. • The frame of the cabinet and all the removable parts (side and rear covers, doors…) are bonded with patch cables that have to be properly fixed and inserted into connectors throughout the period of use of the cabinet. • RPE - cable entry openings placed in the top and in the bottom part of the cabinet are secured by removable blanking panels. • RPA - cable entry openings covered with breakout-type blanking panels are placed in the top and the bottom part of the cabinet. • RPE – In case that cables lead through some of the cable openings, it is necessary to seal it by a blanking panel with sealed cable grommets (included with delivery). • RPA – To avoid dust penetration in a case where cables lead through some of the cable openings, it is possible to seal it using a blanking panel with a brush or secure by plastic frame (included with delivery).